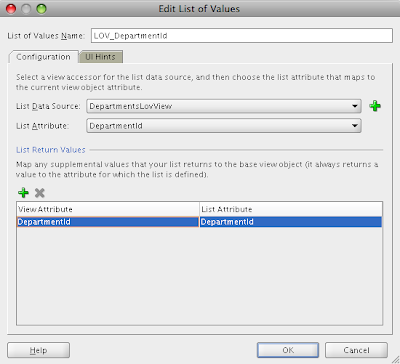 Recently I have noticed strange errors while using LOV components in Query Criteria. 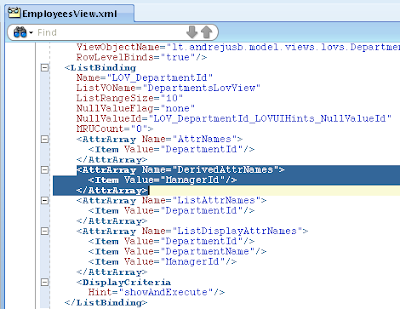 Well, its known issue that you can't have two or more return elements in LOV component present in Query Criteria. But, in my case I was returning only one element - key attribute, and still I was getting error. This error was - javax.el.PropertyNotFoundException. 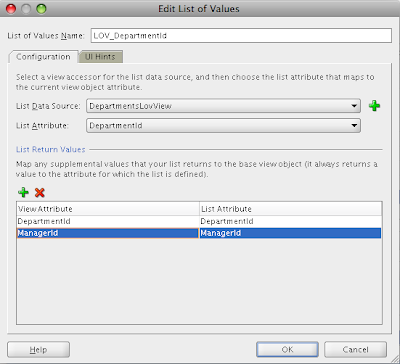 Lucky me - I found the reason for this error, now my LOV is working properly in Query Criteria as well. I will describe what was a trick. Conclusion - sometimes we can get a bug, just by removing bug. Be careful. En este post se describe como solucionar un bug de la herramienta que se produce cuando se intenta crear LOV (Lista de Valores) con 2 valores de retorno. Very useful post! It just happened to have the same issue myself and after spending several hours on that i have decided to google-it. I have never thought about looking into the source code.